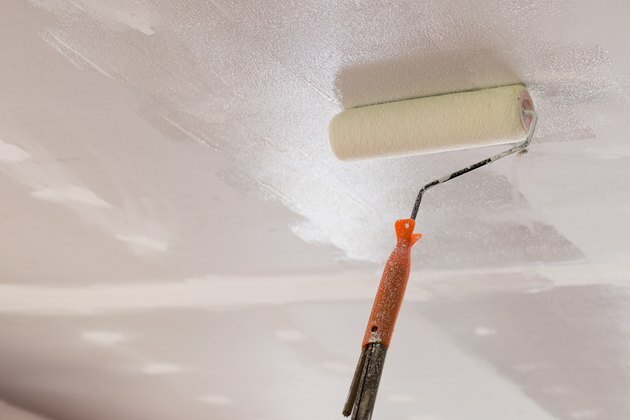 With the right tools and techniques homeowners can obtain quality results when painting a ceiling. Most ceilings are painted with paint that has a flat sheen rather than a more shiny sheen such as semigloss. Flat paints do a better job than other sheens of hiding surface imperfections. And because ceilings do not get as dirty as walls or woodwork, the paint does not need to have the scrubbable qualities of more glossy sheens. Any interior flat paint will do, but most major paint manufacturers offer special ceiling paints. These paints take a little longer to dry and they splatter less than regular paints. Roller covers. For flat drywall use a 3/8-inch nap roller cover; textured ceilings require a 1/2-inch nap. 5-gallon bucket and roller screen that hangs inside the bucket. You can work faster with less bending and fewer drips and spills if you use a bucket and screen rather than the typical roller tray. Roller extension pole. 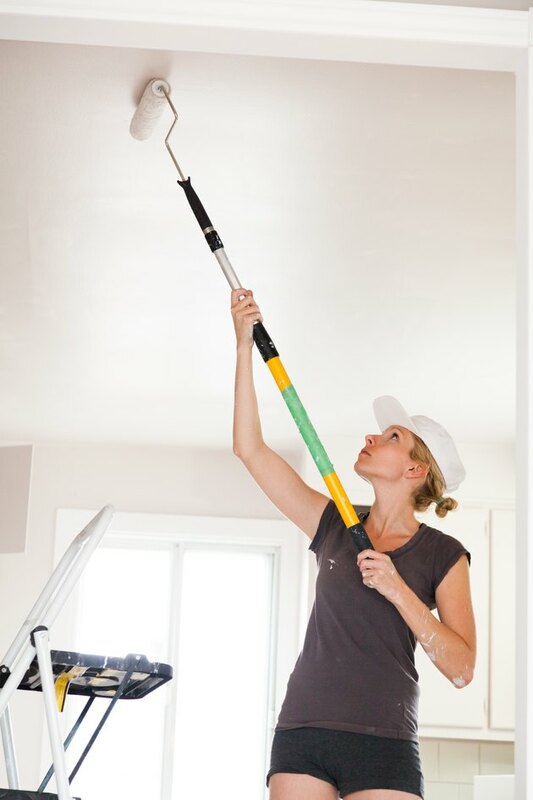 The roller lets you paint the ceiling while standing on the floor, reducing the time needed to climb up and down the ladder. 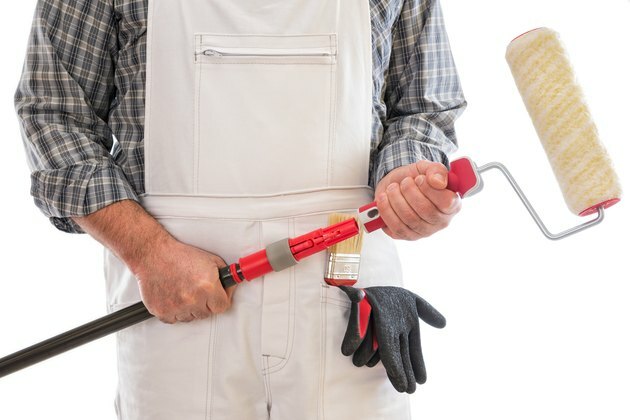 Other tools and materials needed for a paint job: ladders, drop cloths, painter's tape, small paint bucket to hold paint while cutting in, rags, drywall repair materials, and primers. Appropriate clothing. Wear clothes you won't mind getting splattered with paint. And because you will be working overhead, be sure to wear eye protection and a hat. You will find a 5-gallon bucket and roller screen are more efficient to use than a typical roller tray. You will be much more efficient if you work in a room that is as empty as possible. Move as much furniture as you can into another room, and roll up and move all area rugs. Cover anything that can't be moved, including the floor, with canvas drop cloths. Protect ceiling mounted lights and fans by removing the fixture, if possible. Ceiling fans often have a collar that is held in place by screws. You can often unscrew the collar and move it down the shaft of the fan. You may be able to remove the fan's paddles. If not, cover them and the fan motor with plastic. Ceilings usually do not have the nicks and dents that are often found on walls. But if there are imperfections, repair them. Use a pigmented shellac primer to cover any water stains or other discoloration on the ceiling. If you paint over them without priming, the stain will eventually bleed through. Give the typical living room or bedroom ceiling a quick brushing with a clean dust mop. If the ceiling is dirty or greasy, wash it using TSP (tri-sodium phosphate), following the directions on the label. Let the ceiling dry completely before painting. For new drywall ceilings, apply a primer/sealer before painting. 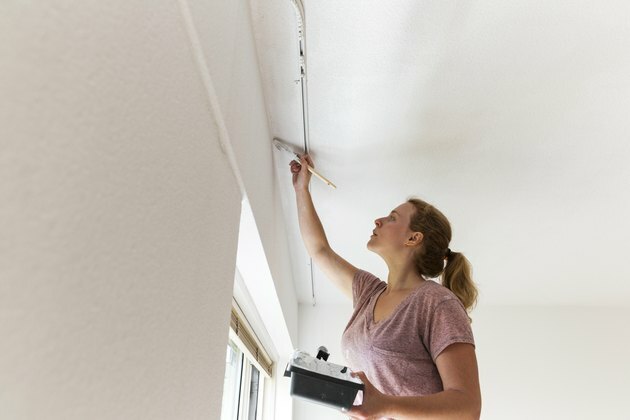 A roller extension pole lets you apply paint to the ceiling while standing on the floor. The directions that follow apply to ceilings that can be reached by standing on the floor and using a roller extension pole. For higher ceilings, you will need tall ladders or you can buy or rent interior scaffolds. These are usually narrow enough to fit through most door openings, and they are mounted on wheels so that you can roll the scaffolding to where you need it. While not absolutely necessary, one suggestion is to place the 5-gallon bucket, small paint container and spare rags in a low-sided plastic bin. The bin keeps everything where you can get to it quickly, drips are captured by the bin, and the hard plastic provides a firm base for your paint bucket. Pour the paint into the bucket. Run a lint brush, or even the sticky side of masking tape, over the roller cover to remove any stray fibers. Cut in around the perimeter of the ceiling using a small sash brush. Apply painter's tape along the top edge of the walls. Then, starting in a corner, use the sash brush to apply a narrow band of paint along the edge of the ceiling. Work out about 5 or 6 feet in each direction from the corner. 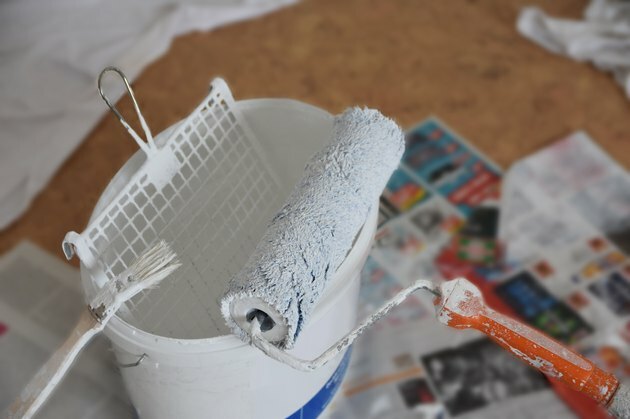 When painting, work toward a wet edge: After laying down some paint, reload the brush, or roller, begin in an unpainted area and work back toward the wet paint. This helps to avoid lap marks when the paint dries. Load the roller by dipping it into the paint in the bucket and rolling it against the roller screen hanging inside the bucket. Begin rolling the area between the cut-in sides. Roll in one direction and then roll at a right angle to ensure even coverage. By alternating between cutting in and rolling you will set up a comfortable working rhythm. When painting new drywall, apply primer/sealer before rolling on the paint. Sometimes painting a textured or popcorn ceiling can damage the finish. Test the finish in an inconspicuous area before starting. If there is a problem, one solution is to have a professional spray paint the ceiling. But if the finish holds up, roll lightly and don't go back and forth as much as you would on a flat ceiling. If possible, try to complete the entire ceiling in one session. If you plan on working the next day, wrap the rollers and brushes in cling wrap and place in plastic bags. You can buy snap-on covers for 5-gallon paint buckets so there is no need to pour the paint back into the can. If you won't be continuing, the only chore left to do is clean up.